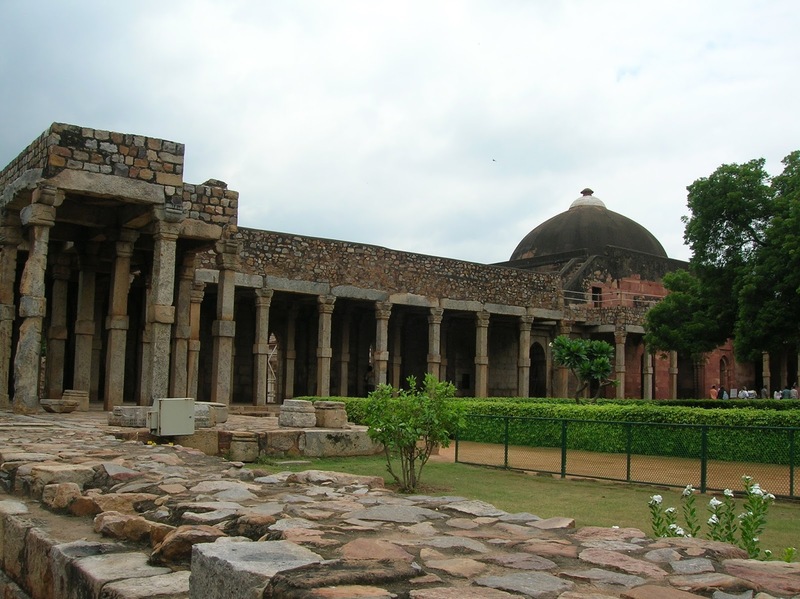 Who built Qutb Minar? Muslims or Hindus? 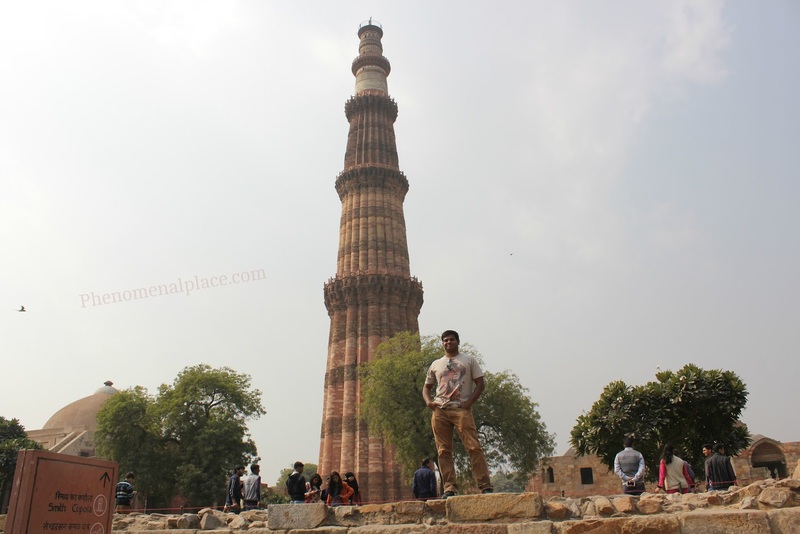 I have been researching this brilliant monument called Qutb Minar - historians say that this fantastic tower was built by a Muslim ruler called Qutb al-Din Aibak also known as Qutb-ud-din, about 800 years ago. This site is recognized as a UNESCO world heritage site because it full of Islamic structures like India's first mosque, the Qutb Minar and tombs of famous Mughal kings. However, were these structures really built by Muslim kings? Watch the video below or read on. Now let's take a good look at these structures, they are definitely Islamic structures. You can see the domes on top, verses of Quran in Arabic carved on the walls, and typical Mughal designs all over the structure. There should be absolutely no doubt in your mind that these were built by Muslim rulers. But let's take a look at this unfinished structure nearby. Here you can see how a dome has been constructed on top, but is not finished. Below this dome, you can see that the pillars look very similar to the pillars of a Hindu temple. You can see typical temple bells carved on these pillars. But let's go closer and see if we can find more evidence. Here we can see the defaced carving of Lord Ganesha, the Elephant God who belongs to Hinduism. 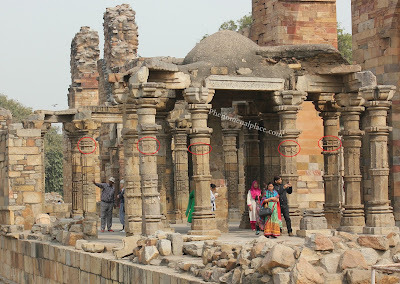 What is he doing in the Qutb Minar complex built by Islamic rulers? In fact, we can see many, many carvings of Indian Gods that have been disfigured in this site. On the top, you can even see the war scene from the Hindu epic Ramayana. Remember, carvings of God, saints and human beings are completely prohibited in Islam, so this absolutely not an Islamic structure. You can even see the Hindu religious altar called Balipeetam. Now, let's go back and look at the big picture. On the left, is the Jama Masjid which is hailed as India's very first mosque built by Islamic rulers. On the right, is a Hindu temple, on top of which an Islamic dome has been built. The only difference between the left and the right photographs is that the structure on the right was not finished by Muslim Kings. Had the dome been finished, pillars been polished to remove the carvings, the walls been covered with new plaster, and Islamic designs and verses written on the walls, you would believe that this was also built completely by Islamic rulers. 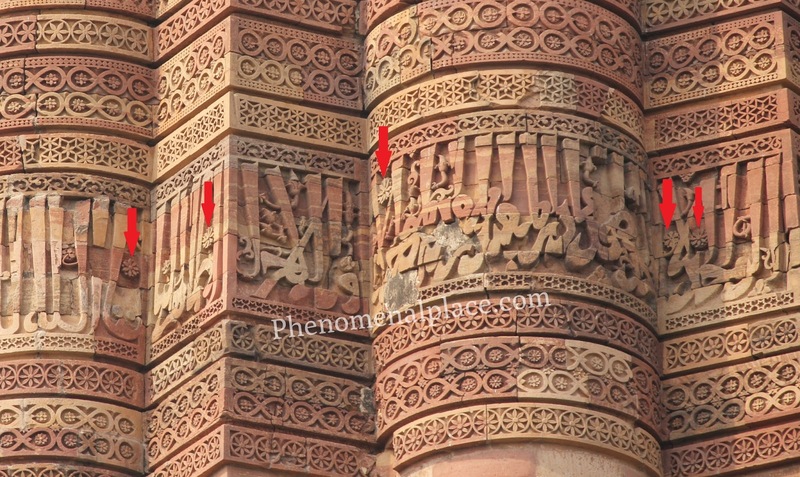 Both these pictures were taken at the site of Qutb Minar complex, they are only a few 100 feet apart. Walking through various structures of this complex, I realized that if you don't see the dome from the outside, you would think this is a Hindu temple, because it is a Hindu temple that's merely been converted for religious convenience. Islamic rulers did not even take the time to demolish the ancient temples completely, and build new structures with the same material. They made simple changes to the existing temples and renamed them as Islamic structures. This is evident when you see that the dome on top looks completely different from the rest of the structure. This wouldn't be the case if they reused the materials from demolished temples. They simply constructed a new dome with a different material on top of the existing Hindu temple, and defaced the walls which had carvings of various gods. This is confirmed when you look at the ceiling from the inside of the so-called mosque, it looks identical to the floral or cymatic designs of ancient Hindu temples. All these evidences, clearly prove that the structures around this brilliant tower were in fact Hindu monuments. But what about the tower itself? Was Qutb Minar, the most important piece of this complex, built originally by Muslim Kings? 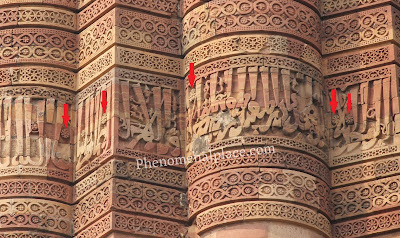 To understand this, we must understand why the Qutb Minar was built. Why was this structure built to a stupendous height of 240 feet? I mean, what is the purpose of this structure? The main reason given by historians is that this was used as a Minaret, a place where a man could stand on top and call the locals to come to the mosque for prayer. But there are many problems with this theory. Why did the Minaret get all the beautiful decorations, while the mosque which is the main building, is almost in ruins? The entrance of Islamic Minaret's must face east, but the Qutb Minar's entrance faces north. If you climb to the top of the tower using the narrow spiral stairs, it will take you more than 45 minutes. How did anyone climb up and down 5 times a day? Assuming you do this, the tower is so tall, that even if you shout at the top of your lungs, nobody in the ground can hear you. The sound you make from that height actually gets dissipated and dispersed, failing to reach the people on the ground. You would need a mic, to be heard from such a height and microphones didn't exist 800 years ago. Historians also give another reason: The Qutb Minar was built as a symbol to celebrate the victory and power of King Qutb-ud-din. If establishing the fame and power of himself was the main reason for building this tower, there should be some inscription on the structure that bears his name. After all, Historians say that this tower is the best achievement of him in his lifetime. 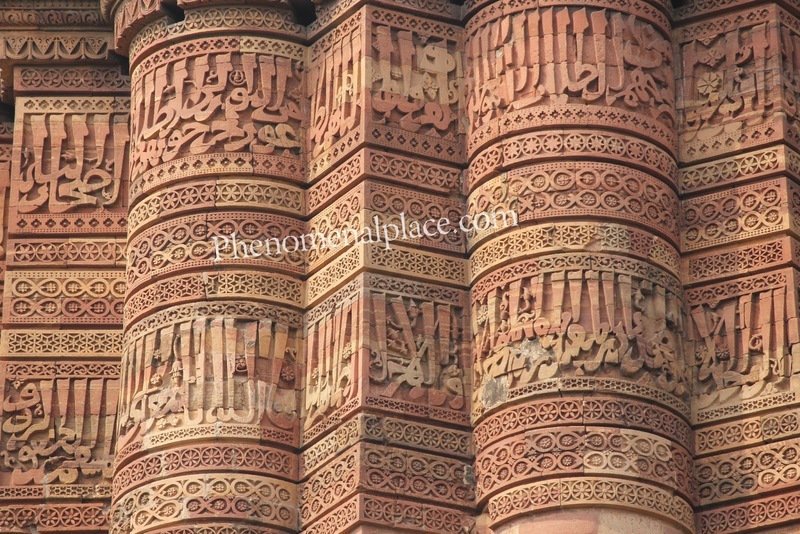 However, Qutb-ud-din's name is not inscribed anywhere on this tower, even though there are thousands of other Arabic phrases inscribed on the walls. 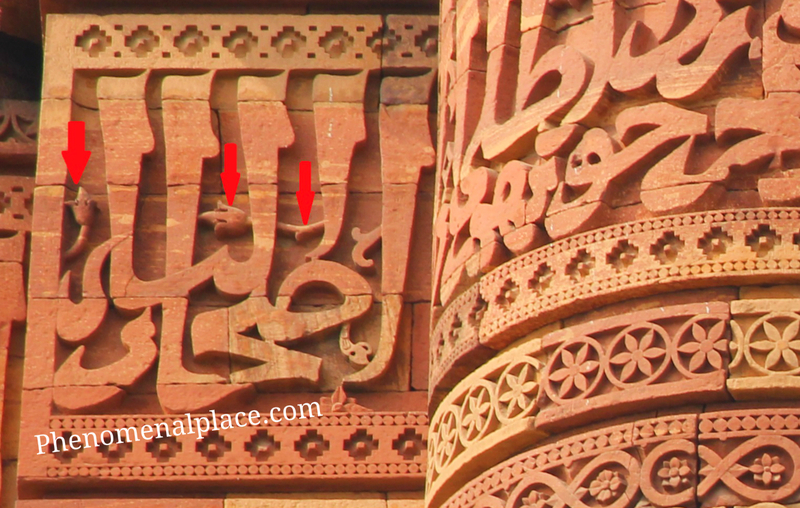 What's even more strange, his name is clearly inscribed on the walls of the nearby mosque, and it explicitly mentions that Qutb-ud-din did in fact establish the mosque. 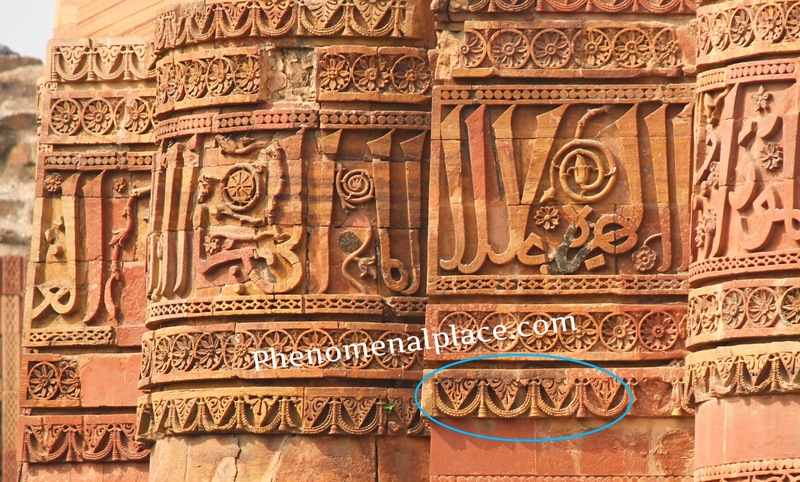 If Qutb-ud-din constructed Asia's tallest stone structure at that time, and built it as a symbol of his power, why did he not have his name carved on it? Other flimsy reasons like this was built as a watch tower are nonsense because Qutb-ud-din never built a fort anywhere in this area, in fact he lived in Lahore which is more than 250 miles away. Not to mention that watch towers don't have to be superbly decorated and covered with the verses of Quran. In fact, most of the tourists who visit this site, are completely unsatisfied with these explanations as to why the Qutb-Minar was built. To this day, the question of "Why Qutb Minar was built" is quite popular on Google. 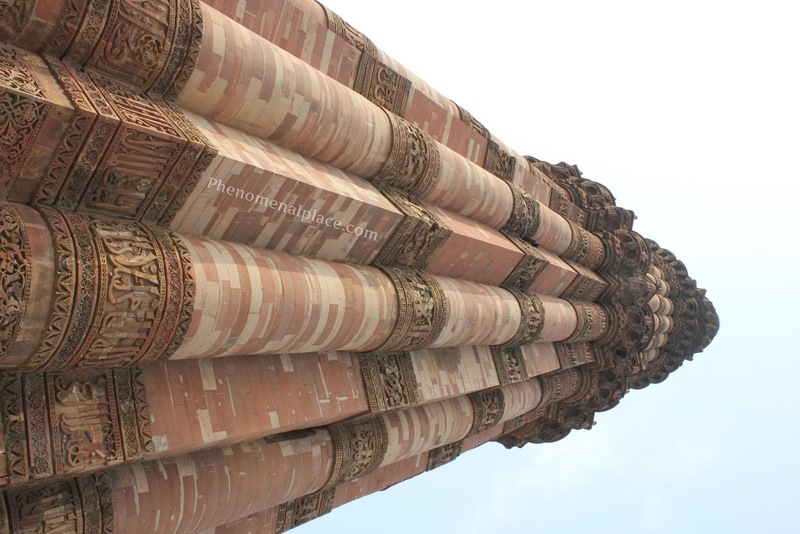 The other baffling question is this: How was Qutb-ud-din able to build such a grand tower? All historians agree that he ruled this place for just 4 years. How did Qutb-ud-din, who couldn't even build these smaller structures, and merely dressed them up as Islamic structures, manage to build this breathtaking monument within just 4 years? Imagine the time when Qutb-ud-din first reached this place. This place was totally filled with ancient Hindu structures, the Qutb Minar is still completely surrounded at the base by these demolished Hindu monuments. 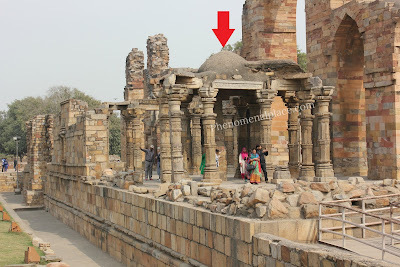 Did the ancient Hindu builders leave an empty space of 50 feet diameter exactly in the center of the complex, so that Qutb-ud-din can come centuries later, and conveniently build the Qutb Minar? What's more interesting is that the term Qutb-Minar itself must have been coined in the 1800s, to attribute the tower to King Qutb-ud-din. Because the term Qutb-Minar does not appear in any Historical document before the last 2 centuries, even Muslim historians do not mention this term. Also, many historians are spinning theories that it took many centuries to build the tower, and different levels were built by different kings. This is a joke, because this kind of extremely tall structures need a deep foundation, otherwise the entire structure will just crumble down. Think about this, if the first Mughal king only wanted to build one level, he would have only created a shallow foundation. Another king who decided to build the next two levels cannot just go back and deepen the foundation. He must simply demolish this and start from scratch. This is like saying the empire state building was initially built as a single storey house, and eventually people just built multiple floors on top of the house. These kind of structures must be planned and built from start to finish, otherwise they will just collapse like a house of cards. All these evidences mean that this tower was built as an integral part of the Hindu temple complex, constructed much before the time of Muslim kings. 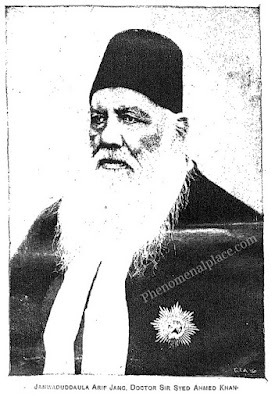 Ironically, the very first paper published that Qutb Minar is a Hindu monument was put forward by a Muslim archeologist, by the name of Syed Ahmed Khan in 1852. In his paper Āsār us-ṣanāddīd, he states many reasons as to why this is a Hindu structure. 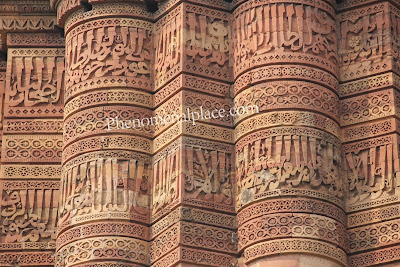 When we casually look at Qutb Minar, it does look like a Muslim monument because it is covered with verses of Quran in Arabic. 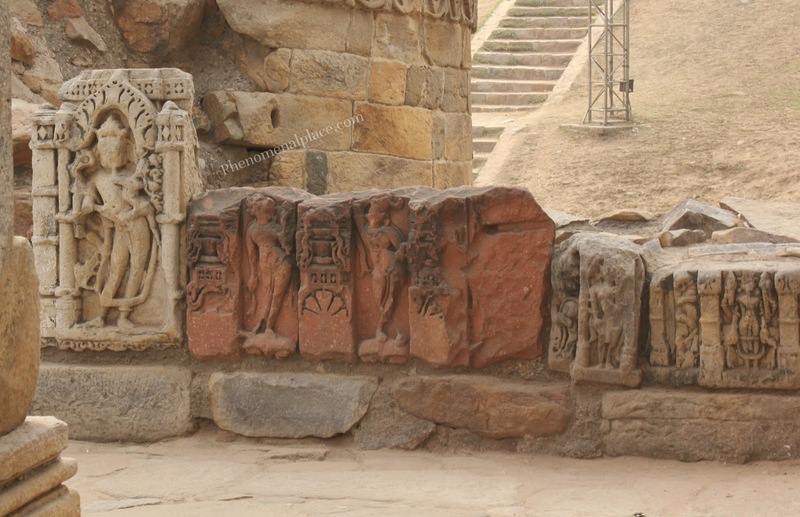 However, if you observe the walls carefully, you can see that Hindu carvings appear all over the place. 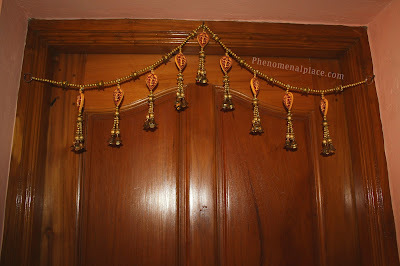 Here, you can see these patterns of bells and chains, which are Hindu symbols. This is confirmed when you can see the exact same design of bells and chains on the damaged Hindu temples in the same complex. In the picture below, you can see it is all over the pillars. 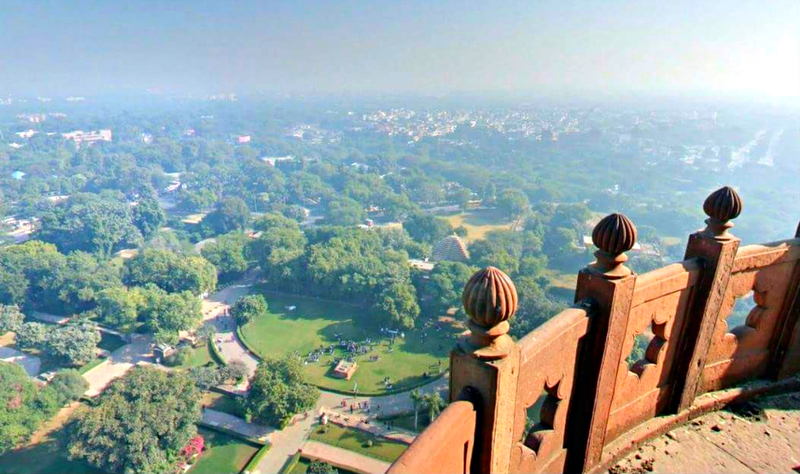 This means that the tower was built around the same time as the ancient Hindu temples, and not by the Islamic kings who arrived much later in time. Now, is it possible that the Islamic kings simply liked this design, and asked the local builders to reproduce them on the Qutb Minar? Bells are actually forbidden in Islam, because Prophet Mohammed has said that "The bell is one of the musical instruments of Satan." There is no way that any Muslim king would ask his workers to carve bells on an Islamic monument. On the contrary, it is a well known fact that Hindus use bells in all their temples. In fact, these type of melodious bells and chains are hung in many Hindu homes, even today, as a religious symbol. This proves that Qutb Minar was in fact a Hindu monument, that was merely dressed up as an Islamic structure, just like how the other temples were turned into Islamic buildings. The Arabic verses were simply added much later in time, to make it look like a Muslim monument. Syed Ahmad Khan, who was an expert on Arabic says that many of the Arabic verses on the tower have wrong spelling and grammar, and make no sense. These verses were added in a hurried and sloppy fashion, just like the disfiguring of the other temple's walls. 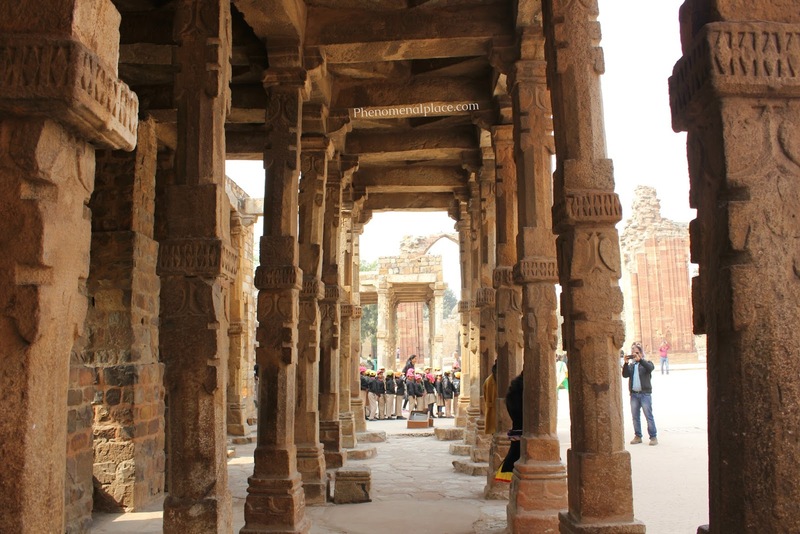 The entrance of Qutb Minar faces perfectly to the North, just like most ancient Hindu temples. The Muslim kings at that time, would not have guessed that people today can examine the walls with binoculars and zoom lenses. So they did not bother to disfigure smaller carvings. 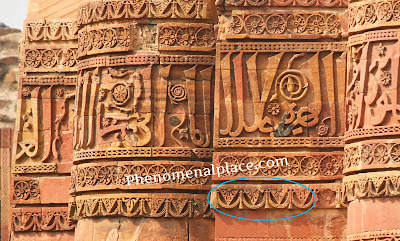 There are patterns of lotus flowers carved all over the walls of the tower, which is a sacred Hindu symbol. Islamic invaders could not have used them, because lotus flowers simply do not grow, where they came from. These Large Arabic verses are eye-catching, but if you observe closely, they have been added on top of Hindu designs of lotus buds. 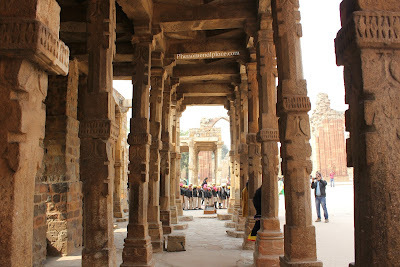 Not to mention that the Qutb Minar is made of the exact same material that the ancient temples are made of. All these evidences prove that the so called Qutb-Minar was in fact an ancient Hindu structure that existed much before the arrival of Islam in India. However, this is not the end, but just a beginning. What is the original name of this tower? Why was it built? To understand its origin, we must look at another mysterious structure in the temple complex - the Iron Pillar of India. I will explain this in my next post. Thanks Praveen... great information... Kindly let us know about your other videos too. Very nice Praveen. Keep going. The truth must come out. Hello Praveen, i follow every video you post and they are simply awesome. Your work is soo great, keep going. Good work and highly appreciate your interest in bringing in the insight of historical structure. My question is if these claims were true,then why didn't Archaeology Survey of India pickup. Are there any survey made by them (ASI) yet? Is the Govt of India wanted us to believe and retain post Moghul era as the only history and not before their period ?. Anyways if the ivestigation proved to be true, Govt of India shall appoint a commission and restore truth using latest technologies to prove it. Hi Praveen, very proud of your work. These so called muslims actually BUTCHERED the daughter, son in law Ali and both grandsons Hassan and Husayn in the most heinous manner, esp the last one and Hassan was poisoned. Do not go on their long beards or dress or head gear etc. The kharajite worship whats between their legs. Many never became real muslims like mystics the sufis and certain shias but just power and money hungry despots. Do not blame the true muslims for the deeds of hypocrites as no one blames true hindus, true jews, true christians, true buddhists for fake hypocrites among them worshipping whats between their legs. Hello Praveen, where is your video on the Iron pillar? You did not give any link to that. I like all ur videos u have posted at u tube. I am Kshitij Bhagwat from Mumbai. Please give me ur number or call me on 8788738851. Thanks, Praveen Mohan ji, for enriching me of the history. How nicely & logically you explain about our historical monuments and temples. I feel so proud about our country, culture and us,the sanaatan dharmi. It is through you I've learnt truly about our culture. Thanks and God bless you. Very thorough, but you said this - The entrance of Qutb Minar faces perfectly to the North, just like most ancient Hindu temples. Please excuse if I'm wrong but I thought the entrance of most Hindu temples faced East? Very good.Feeling sad that the hindu tradition of "qutub" complex has been maligned by wretched invaders. Yes,the real name of "qutub" minar is VISHNU STAMBH .There was a huge statue of PADMANABH VISHNU in this place.Missing it now. Well said, logically reasoned, backed with substantive evidence encircled in highlight! = "The TRUTH must come out!" Very near to the truth. Most of the big mosques in India are temples. Thanks Bro Keep up the Good Work.. There was a king jayachandra ..and could the iron pillar had his name and ironically was defeated and killed by Qutub . The last powerful king of his dynasty, he was defeated and killed in 1194 CE, in a fight against a Ghurid army led by Qutb al-Din Aibak. Jaya-chandra (IAST: Jayacandra, r. c. 1170-1194 CE) was an Indian king from the Gahadavala dynasty. He is also known as Jayachchandra (IAST: Jayaccandra) in inscriptions, and Jaichand in vernacular legends.